Hermione wrote: I suppose it's a light weight option compared with all my coffee making paraphernalia, but somehow getting up on a cold morning and munching a couple of coffee beans doesn't have the same appeal as a hot drink. How about starting with hot porridge and finishing off by munching half a dozen coffee beans coated in dark chocolate. The dark chocolate seals them from the air and keeps them fresh after roasting. Six gives me enough of a caffeine buzz to carry me through the first hour of walking. ribuck wrote: How about starting with hot porridge and finishing off by munching half a dozen coffee beans coated in dark chocolate. The dark chocolate seals them from the air and keeps them fresh after roasting. Six gives me enough of a caffeine buzz to carry me through the first hour of walking. First off, porridge has absolutely nothing to do with drinking coffee. Second, eating whole coffee beans isn't drinking coffee anymore than snorting instant coffee powder is. Third, the hypothesis that chocolate keeps the coffee beans from oxidizing is just that, a hypothesis. Fourth, unless you make them yourself the beans used are invariably of inferior quality. Orion wrote: First off, porridge has absolutely nothing to do with drinking coffee. The porridge reference was in reply to the post above it, which lamented that a coffee-free breakfast was too cold. Thanks for your suggestion of snorting coffee - that sounds like it has potential. I think my previous post about hot coffee wasn't very, what I really meant was proper coffee as I don't one achieves quite the same extraction from chewing beans. Mind you, my bushwalking coffee to date has been fairly dismal. Hermione wrote: ...I don't [think] one achieves quite the same extraction from chewing beans. Optimal extraction is around 20% whereas chewing the beans is 100% extraction. That includes a lot of cellulose, which (like oats) makes for good horse food. The fraction that goes into solution in your mouth is likely pretty low. But since it's mixed with mediocre chocolate and burned cellulose it hardly matters. 100% would be over extracted, I'm talking about getting the balance of flavours right (something I still struggle with in the bush). Hermione wrote: 100% would be over extracted, I'm talking about getting the balance of flavours right (something I still struggle with in the bush). I was kind of joking with that. I mean, technically, you're consuming all of it so it's 100%. But in terms of flavor the fraction that dissolves in your saliva as you chew the beans wouldn't be very high. The temperature, time and "grind" all point to serious underextraction. But in this context, who cares? Are the beans in those candies even worth thinking about in terms of brewing? They aren't going to be coating high quality freshly roasted SO coffee with dime store chocolate and then selling it for less per kg than commodity coffee costs. Try this experiment. Lick all of the chocolate off of a couple hundred beans, dry them out, then grind and brew a cup. Serve it to some unsuspecting person and observe their reaction. Then tell them how you made the cup and observe their second reaction. Orion wrote: Lick all of the chocolate off of a couple hundred beans, dry them out, then grind and brew a cup. Could be fantastic like Kopi luwak or civet coffee. That's just not going to do. I have some kopi lowak here somewhere but it is so sweet and so oily that I really don't like it. A human fermented version could be interesting! Oops I'm forever missing the nuances of humour on here, but coffee is a very serious business! Perhaps it would be possible to solar power our home coffee machine, weight might be an issue as I think it weighs twenty something kilos. A propos.. the Indonesian brand of coffee candy ("Kopiko" I think)) does have caffiene. European coffee flavoured sweets don't. I've spent 10 years in the coffee industry (barista, roaster, etc) previously. My preferred way of making coffee while out hiking or bikepacking is using either immersion brewing (americans know it as cowboy coffee) or an aeropress if weight is less of an issue. As with all coffee making, the most important part is the coffee. I use filter roasted coffee, mostly from either Market Lane or Small Batch Roasters (both based in Melbourne, but ship). Before I go out I weigh, grind and vacuum seal portions—individual or for however many people I will be making coffee for if not using the Aeropress. While freshly ground coffee is better in theory, most hand grinders anyone would feasibly take with them fall short of their electric counterparts for a variety of reasons, so in compromising I choose grind quality and convenience over freshly ground (and for the grind levels you'll be using for these two brew methods, even 24 hours isn't a big deal). 3. Stir to make sure all the coffee is wet; 10 big swirls with a spoon or so. 6. After 5 minutes, take the lid off and very gingerly (like you're decanting an old bottle of wine) pour the coffee into the receiving vessel (optionally through the java drip filter). By not agitating the brew you should be able to pour off nearly all the water without getting a clump of wet grounds coming out. Pretty simple in the end. I'm particularly fond of the GSI-filtered immersion brew. The filter is originally intended for you to do pour over coffee, but doing that with a pot holder on a pot without a pouring spout squatting on the ground for 2-3 minutes straight is an exercise in frustration. So yeah, no. Great little filter I can see a ton of uses for aside from coffee. You could get the choc coated ones and then have a valid excuse for having chocolate for brekky. I've used an aeropress for camp coffee quite happily, especially paired with a porlex grinder (fits inside the plunger, other hand grinders don't) and an Able/Coava/Kone laser etched disc in place of disposable filters. 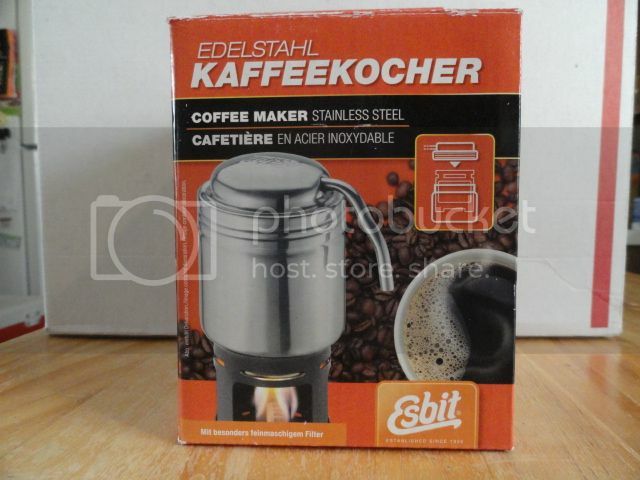 I tried an Esbit 'moka' device that used a tiny hexamine stove, but was never happy with the brew. My current favourite is the GSI dripper, not the collapsible silicone one that needs filters, but the nylon mesh sock with three legs. packs down to nearly nothing, no filters needed. Is it usually nice and sunny and warm like in that photo? I make my coffee for breakfast. It's morning, it's often early and it can be kind of cold out. Drip methods, long uninsulated steeps or slow open filtering all lead to the same problem: cold coffee. That's one of the reasons I use an Aeropress and a relatively fine grind. The steep time required is minimal. It's basically just fill, stir and press. One minute maximum. Then "pop" out the puck and filter into a bag for carryout. The Aeropress doesn't require much in the way of cleaning as it squeegies itself when you press. flippant wrote: While freshly ground coffee is better in theory, most hand grinders anyone would feasibly take with them fall short of their electric counterparts for a variety of reasons, so in compromising I choose grind quality and convenience over freshly ground (and for the grind levels you'll be using for these two brew methods, even 24 hours isn't a big deal). I usually go out for a lot longer than 24 hours. And it's more than just theory that freshly ground coffee is superior to pre-ground. Even a relatively coarse grind loses a lot in a day. I must admit I've never tried vacuum packing or using an inert gas though. The porcelain burrs in those lightweight grinders don't produce an acceptable coarse grind, at least not without a lot of careful modification. But for finer grinding they do a decent job. And an Aeropress is fairly forgiving of uneven grinds. I'm packing VIA and sugar for this weekend. I've personally found that medium ground coffee keeps relatively well in an airtight container for a few days, and is still drinkable probably up to a week. Lucky for walking I have access to a cryovac machine, but that does add a lot of plastic packaging. I also get much better results with shorter brew times - 30 seconds to a minute max seems to give me the best flavour and going longer only adds acidity and bitterness. I guess that depends on what coffee / roast / grind you're using through. Orion wrote: And it's more than just theory that freshly ground coffee is superior to pre-ground. Even a relatively coarse grind loses a lot in a day. I must admit I've never tried vacuum packing or using an inert gas though. The porcelain burrs in those lightweight grinders don't produce an acceptable coarse grind, at least not without a lot of careful modification. But for finer grinding they do a decent job. And an Aeropress is fairly forgiving of uneven grinds. Sorry, I should've been clearer in communicating that the "theory" was meant to be more of an all-encompassing theory-versus-practice in what makes the best coffee experience while out hiking, not isolated to grind quality alone. There's no disputing that freshly ground coffee roundly beats pre-ground coffee in almost every case, but as flavour is dependent on much more than how recent the grind is, the actual, experienced cup quality might not be so different after all. I invite you to perform a blind cupping of coffees ground at various times. Depending on how fresh the beans are and what sort of flavour profile they have, you might very well prefer coffee that has been ground quite a bit in advance! It's very interesting! I travelled around full-time with an Aeropress and a Porlex for quite some time and don't really rate the grinder. Like you say, its distribution becomes worse the coarser you go, so it's necessary to grind quite finely and use shorter extraction times to get technically good (e.g using a refractometer) extractions — that unfortunately don't taste quite as good. My personal preference skews toward clarity and bright, acidic coffees, so your mileage may vary. Orion wrote: Is it usually nice and sunny and warm like in that photo? I make my coffee for breakfast. It's morning, it's often early and it can be kind of cold out. Drip methods, long uninsulated steeps or slow open filtering all lead to the same problem: cold coffee. That's one of the reasons I use an Aeropress and a relatively fine grind. The steep time required is minimal. It's basically just fill, stir and press. One minute maximum. Then "pop" out the puck and filter into a bag for carryout. The Aeropress doesn't require much in the way of cleaning as it squeegies itself when you press. Over the course of that trip the mornings varied from sunny and nice to windy, raining and icy. Yes it cools faster, but for this trip the volume of the dripper was more important than a few degrees warmer coffee and losing bag space for the aeropress (and an insulated mug, and a grinder and...). Sometimes I pack the dripper, sometimes the aeropress, sometimes teabags. horses for courses. I agree that pretty much every hand grinder has poor particle size distribution as delivered. Depending on the trip I'll pre grind or take a grinder, I'm camping so any coffee* is nearly as good as freshly ground artisanly brewed single origin coffee. flippant wrote: I invite you to perform a blind cupping of coffees ground at various times. Depending on how fresh the beans are and what sort of flavour profile they have, you might very well prefer coffee that has been ground quite a bit in advance! It's very interesting! For many years I didn't own a grinder. I had the local shop grind freshly roasted coffee for me. I know very well how it deteriorates with time. But I would welcome a specific blind tasting experiment to try. I am well aware that I am not fully aware. flippant wrote: ...your mileage may vary. I thought Australia went metric years ago? blakey_ wrote: Over the course of that trip the mornings varied from sunny and nice to windy, raining and icy. Yes it cools faster, but for this trip the volume of the dripper was more important than a few degrees warmer coffee and losing bag space for the aeropress (and an insulated mug, and a grinder and...). Sometimes I pack the dripper, sometimes the aeropress, sometimes teabags. horses for courses. If it works it works. Maybe I should try some of those methods that failed me in the past again. blakey_ wrote: I agree that pretty much every hand grinder has poor particle size distribution as delivered. I think you mean **lightweight grinders**. My primary grinder is a hand grinder and it produces excellent grinds. But it weighs about 1kg. The Starbucks VIA isn't so bad. And there's a startup company that's making high end instant coffee. I haven't tried it and it's currently kind of expensive, but I'm hoping that it's the future for bushwalking. After reading though all these posts I am thankful that my taste buds are crap. While I can distinguish between real coffee and instant - I don't drink instant - I just need it strong and black. Cowboy coffee for me. On grinding this coffee beans, anyone tried to grind them using those traditional aboriginal techniques, in a rock grove? Been seeing quite a lot of those around the place. Feasible? Another alternative (though hideously expensive at the moment) is Sudden Coffee, billing itself, simply, as good instant coffee. I can't speak to whether or not this is accurate, but I trust Kalle. Yeah, that's the one I was referring to. I hope it's what it purports to be and is eventually more affordable.